Product #21436 | SKU 9200 | 0.0 (no ratings yet) Thanks for your rating! The PCIe-424 card from MOTU is a component of the company's 424 hard disc recording systems and is installable into any Windows or Mac computer featuring PCIe architecture. 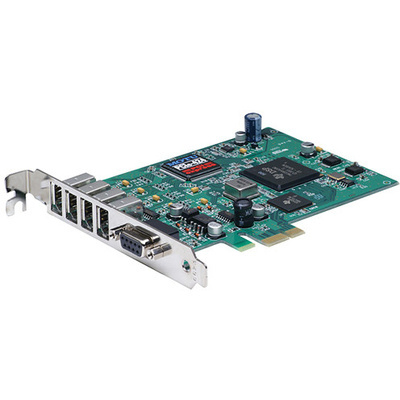 While a PCI card is already included with the original purchase of one of these systems, user of older PCI-X cards may want to run their systems on newer PCIe slotted computers. PCI Express guarantees each device dedicated bandwidth to and from the system controller and card slots are defined by their bandwidth, or number of data lanes - typically one, four, eight, or 16 lanes. There is more than enough bus bandwidth for the 424 card regardless of the type of lane slot used, while simultaneously ensuring that other PCI devices won't "steal" bus cycles from the 424 card.